Please find below the latest working papers from the three working groups. These are working documents, thoughts and views are welcomed. Listening Group: working paper (reviewed draft). Responsibility Group: working paper (first draft). Welcome to the discussion on organisational character. As co-chairs, Anne and I wanted to provide a short couple of paras to you around our ‘statement of intent’ for this Group to serve as a conversation starter. An organisation’s character, like those of people, is determined by the values it adopts and pro-actively lives by. No-one imposes these values, they are self-determined. The values an organisation lives and operates by shapes its culture, frames the interactions it has with all stakeholders and ultimately how it acts. As with a person, if an organisation does not live by the values it purports to, then stakeholders are entitled to question the authenticity of the organisation. Any gap that exists between how an organisation says it acts and how it actually acts, or put more simply the difference between stakeholder perception and the organisation reality, creates potential reputation risks and other issues. With the explosion of digital technology, the impact of social media and increasing pressure on organisational transparency, the magnifying glass has never been so acutely focused on organisations and how they operate. Reputational risk is public relations territory and this is why practitioners should be involved in helping determine and/or test the ‘character’ or rather the values that underpin the character of an organisation. Does the organisation truly lived by its values? Does it have the proof points to back this up? And, do the values they stack up against what stakeholders expect of the organisation? In our working group we want to come up with a practical tool (possibly called an Integrity Index) that helps organisations to identify if and how they live up to their values. The tool can be used not only as a measure of integrity, but as a means for stimulating discussions and actions that address issues that affect the purpose, strategy and operations of organisations. We believe this will provide a significant and practical outcome from the Mandate discussions and help further move public relations up the strategic value chain. In an age where the value of an organization lies increasingly in the value of its relationships and reputation, communication is becoming something that defines who you are rather than what you do. How can this be explained and made real? How do communicators help CEOs define and lead these new organizations? How can communicators embed listening-based communication across the culture of the entire organization? How do they then articulate their roles within it? Answering these questions will build on the work of the Sixth World Public Relations Forum in 2010, where professionals from more than 30 countries contributed to and endorsed the Stockholm Accords defining the value contributed by public relations professionals to organizations and society. But the world today is different from what it was only two years ago, as organizations and society struggle to adapt in an age when both internal and external publics have unprecedented communication access, influence and power. Informed by the Stockholm Accords and a recent survey of its members around the world, the Global Alliance is now exploring an updated approach to the organizational and societal value that communicators can contribute as we prepare for our 2012 World Public Relations Forum in Melbourne, Australia. If reputation is an absolute measure of how others judge an organization, an authentic and aspirational effort to define its DNA or core character and ways of doing things might be the organization’s way of influencing the factors that build that reputation. 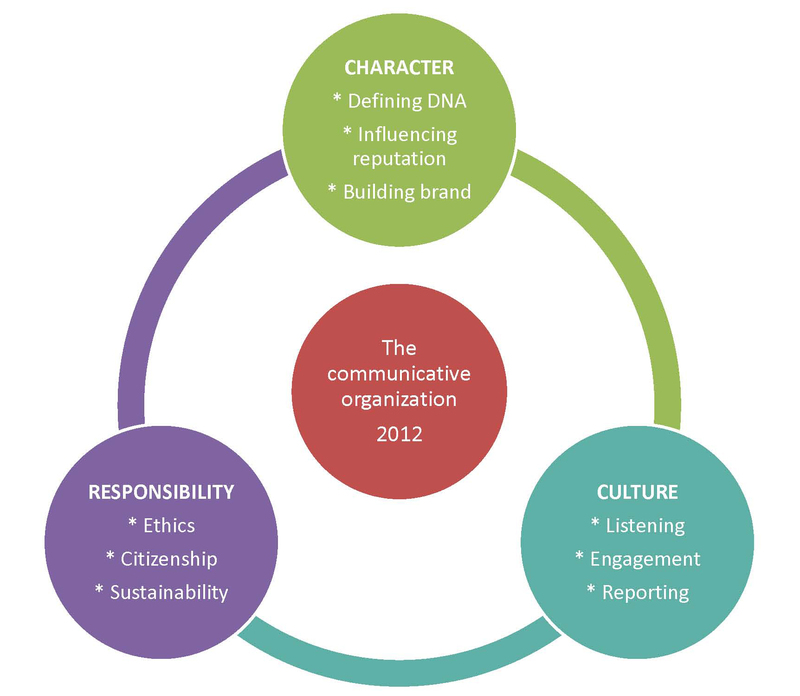 How can communicators contribute to defining, maintaining, assessing and sustaining an organization’s DNA or core character? The widespread use of digital networks makes communication a richer and yet riskier process than ever before. But today’s tools are only a means to an end: that of embedding a culture of listening and engagement not just in the communications department, but across the organization. How can communicators develop and deploy this culture for the benefit of both the organization and its stakeholders? Individuals, organizations and professions bear responsibilities to society – bringing ethical and sustainability considerations into the decisions and actions we undertake every day. Where lies the nature of a communicator’s responsibility today? Which processes can ensure a coherent, yet sustainable, balance of the three spheres? 4. Any other important issues or areas. Leave a comment on Character, Responsibility and Listening. The site owner retains the right to remove any comment deemed to be offensive or not in line with a respectful debate on the subject of this page.